This is the second part in our series on the microbial populations we harbour and their effects from brain to bowel. As soon as a baby is born – and perhaps even before – microbes move in. Many are seeded from bacteria in the mother’s birth canal if it’s a vaginal birth or from her skin if it’s a caesarean birth. An infant’s milky diet fosters a unique set of gut microbes. The infant microbiome gradually changes until, by the time a toddler is three years old, it has morphed into a more diverse ecosystem that is indistinguishable from an adult’s. Gut communities differ from one person to the next, and are heavily influenced by the food we eat. They are also rapid responders to dietary change, re-configuring for a new diet in just a day or two. Gut microbes do more than just scavenge from the food we eat. They also harvest energy and synthesise essential nutrients, such as certain B vitamins and folate, for us. Indeed, pregnancy sways a mother’s gut ecosystem towards one that harvests more calories per bite. Mice raised to be germ-free are skinnier than their germy counterparts, even when they eat more; with no microbes at all, they can’t extract as many calories from their food. There’s now compelling evidence that tinkering with microbes living in the depths of our bowels could be contributing to our expanding waistlines. Scientists are still figuring out what microbiota changes are most detrimental and how such changes cause weight gain. Some of the earliest evidence that gut bugs affect weight gain came from farm animals. Since the 1940s, farmers have fattened livestock by feeding them low doses of antibiotics – enough to affect their gut microbiota but not enough to be therapeutic. Humans, it turns out, aren’t immune to this effect. Taking repeated courses of antibiotics during infancy increases the risk of becoming overweight, at least in childhood, which is a good predictor of obesity in adulthood. The first six months of life are particularly critical. And boys seem to be more susceptible than girls, though why is a mystery. And why infancy is such a crucial time isn’t fully understood either. One suggestion is that it coincides with the time our body decides how many fat-storing adipose cells to lay down to accommodate calories. It’s not just antibiotics that can make a baby’s microbiota fattening. Birth by caesarean section and being fed formula instead of breast milk also seem to tip the scales towards greater childhood weight gain. In many cases, antibiotics, caesarean delivery and baby formula can’t be avoided. And an untreated infection or undernourishment can be far more harmful than a potential increase in the risk of being chubbier as a toddler. The situation in adults is murkier. Scientists are still getting a handle on how disruptive antibiotics – and other chemicals and food additives we encounter daily – might be. Our gut communities tend to bounce back after a dose of antibiotics, but Western gut microbiota are generally less diverse – and perhaps less resilient to disruption – than those of people living more traditional lives. And there’s enormous individual variation. Mice demonstrate the power of gut microbes to influence weight gain between individuals. In 2006, a research group from Washington University in St Louis took poo from obese mice and transplanted it into the gut of skinny, germ-free mice, which promptly became obese. It didn’t matter whether the original obese mice were fat from too much healthy chow or from eating a high-fat ‘Western’ diet. Excess calories seemed to be the key factor turning their microbiota into an obesity-causing (or ‘obesogenic’) community. 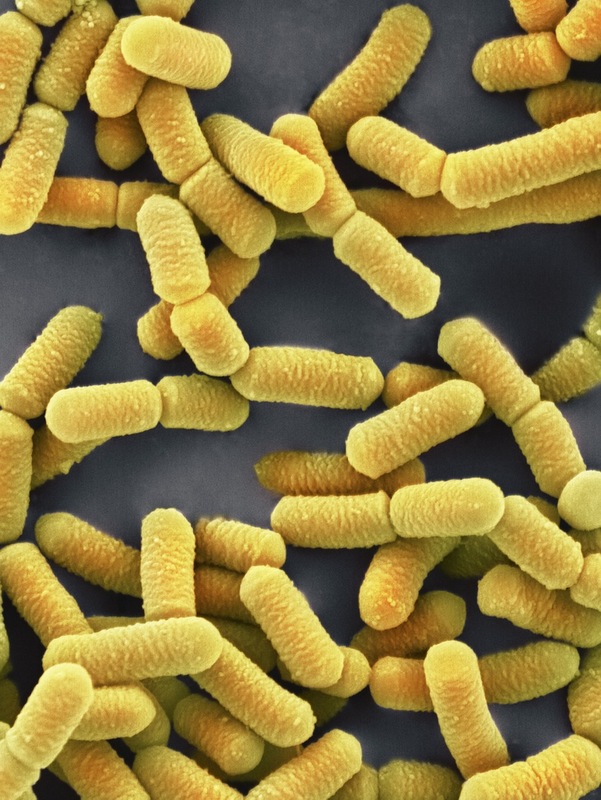 Lactobacillus species are often found in commercial probiotics. But whether they do much for your metabolism is still contentious. A single case report from 2015 suggests the same applies to human-to-human poo transplants. A woman who received poo from her overweight daughter to treat severe diarrhoea became obese in the months following the procedure. So, what makes a microbial ecosystem obesogenic? According to Cox, there doesn’t seem to be any ‘bad’ microbes that take over in an obese gut community. But along with an overall loss of diversity in the ecosystem, a handful of microbes consistently become less common. Other studies have focused not just on who’s there, but what they collectively do. A hallmark of an obesogenic microbiota is a change in the types and amounts of short chain fatty acids microbes pump out after fermenting dietary fibre (and to a lesser extent, protein). Short chain fatty acids provide up to 10% of calories absorbed when consuming a Western-style diet – and probably more in extremely high-fibre, plant-based diets. But they also act as signalling molecules, dialling up satiety messages in our brain, slowing food movement through our gut and boosting fat cell production. How do we keep good microbes happy? Unfortunately, cultivating protective microbes with dietary supplements called prebiotics has seen mixed results. When mice are fed a low-fibre diet, their microbial ecosystem becomes less diverse. Simply re-adding fibre to their diet doesn’t fix the problem – once an organism is lost, it may be lost for good. And over generations, the problem is compounded – mothers can’t seed their offspring with gut bacteria they no longer have. Similarly, in obese women given the fermentable fibre inulin – to boost short chain fatty acid production – weight loss was only modest. And the best responders already harboured particular clusters of beneficial bacteria that could blossom with the added nutrient. Probiotics – consuming live bacteria to replenishing the gut with microbes that have been lost or are limited in number – has been touted as a possible solution. But scientists are yet to identify microbes that reliably work to reduce weight gain, and many strains of so-called ‘good bacteria’ that are available in commercial probiotic concoctions don’t stick around to become long-term members of the gut community. The more drastic approach of replacing the entire ecosystem with a poo transplant hasn’t fared much better. In 2012, researchers in the Netherlands transplanted poo from lean donors to people showing early signs of developing type 2 diabetes, a metabolic disorder that frequently accompanies obesity. Although metabolism improved in the immediate aftermath of the transplant, microbes and metabolism reverted to an unhealthy state within six months. The lesson seems to be that the best way to foster a healthy, diverse gut community is to feed it right from the get-go – with foods high in fibre, low in fat and not overloaded with calories.